Back and head brown, or yellow-brown, or olive to green; sides lighter; belly light yellow to white. Most scales on sides with bronze reflections. Vertical bars faint, 9-16 (generally more numerous and prominent in young), not fused into a lateral band. Usually 3 dark streaks on each side of head, radiating back- ward from snout and eye; dark opercle spot about size of pupil of eye. Eye usually red or orange. Fins lightly pigmented, caudal fin in adults with darker edge; in young, caudal fin strikingly marked with yellow at base, pronounced dark crescent band through middle, and a whitish edge. 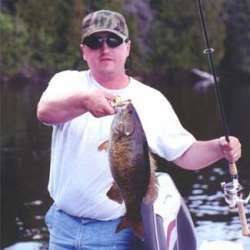 For more Smallmouth Bass photos visit Lake-Link's Photo Gallery. 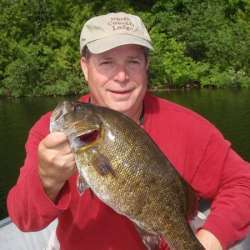 The smallmouth bass occurs in all three drainage basins in Wisconsin (Lake Michigan, Mississippi River, and Lake Superior). It is quite probable that the fish was distributed over the state approximately as it is at present before any introductions were made. 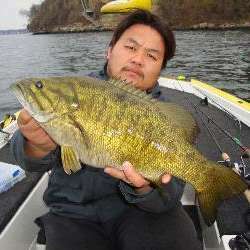 The smallmouth bass is common in medium to large streams and in large, clearwater lakes throughout Wisconsin. In Wisconsin, smallmouth bass spawning usually occurs at water temperatures between 62-64º F, but they have been found spawning at 53º F. In southern Wisconsin, the smallmouth spawns from the middle of May through June (water temperatures between 55-75º F). The male smallmouth may build several "practice nests" until he finally settles on one as suitable. The nest is usually a large, perfectly circular, clean gravel structure. The male bass protects the nest against intruders of his own and other species. 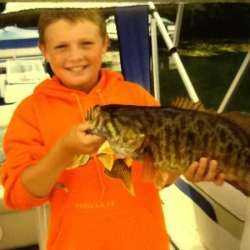 Pound for pound the smallmouth bass is the scrappiest fish of all Wisconsin. It is usually associated with a rocky stream or lake environment where its favorite food, the crayfish, is abundant. Some of the best lake fishing takes place in June during, and just after, the spawning season, and in early fall. Natural baits like hellgrammites, dragonfly larvae and crayfish are especially effective during early morning or late evening. (Note: in Wisconsin it is illegal to possess live crayfish while fishing or while possessing angling equipment on any inland water, except the Mississippi River.) Probably the best artificial baits are those used on the surface. Light tackle is ideal. Fish quietly, casting toward rocks or logs, keeping the rod tip up and the line taut. 6 lbs 7 ozs caught by Mark Samp caught on Strip Mine on March 26, 1985. 7 lbs 4 ozs caught by Dana Yoder caught on Twin Lake on January 1, 1992. 7 lbs 12 ozs caught by Rick Gray caught on West Okoboji on September 1, 1990. 9 lbs 4 ozs caught by W. F. Shoemaker caught on Long Lake, Cheboygan County on January 1, 1906. 8 lbs 0 ozs caught on West Battle, Otter Tail County. 9 lbs 1 ozs caught on Indian Lake, Oneida County on June 21, 1950.